Every event large or small deserves special treatment. We offer the perfect place to host everything from a large-scale fundraiser or event to private social gatherings. We are proud to have played host to some of the Rochester area's largest signature events and fundraisers. Rochester International Event Center is a family owned and operated full service special event and catering facility. 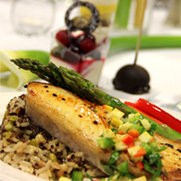 We are Southeast Minnesota's largest and most experienced catering serving the area for nearly a decade. We are proud to partner with area nonprofits and host some of the most prestigious social events and philanthropic galas. We attribute this long lasting relationship not only to our impressive reception facility and staff, but to our longstanding commitment to the greater Rochester area. Our event planning teams and chefs work diligently to create innovative menus, striking decor and lasting memories all within your budget. We work tirelessly with our clients to ensure each group's theme is met and reflected in their vision.